Forster singing sweetly. | NUFC Blog. 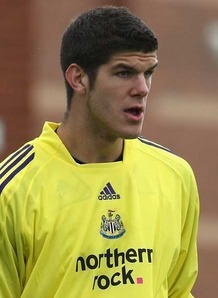 Newcastle United have agreed to extend the loan of bright young keeper Fraser Forster to Norwich City until the end of the season. Norwich manager Paul Lambert said : “I think Fraser has done phenomenally for us and he’s got an understanding with the back four and is performing really well. He said: “You need a presence and some of the saves I see him make, even in training, I think how has he got there? “He’s only 21 years of age and goalkeepers can play for a lengthy time in their career. He’s done great. ““We have no chance of keeping him, the hopes they have got for him,” said Lambert. Let’s really hope so as Forster, who is tipped to win an England under 21 call up, now appears to have caught the eye of Spurs. Tottenham boss Harry Rednapp is said to be targeting Fraser Forster as a long-term replacement for Carlo Cudicini who will be out for some time after his nasty bike crash. Forster’s loan to the Canaries ensures that he is getting regular appearances and he looks a really bright Geordie prospect. Let’s hope that Newcastle’s hopes for him result in us seeing that 6ft 6 foreboding presence in the Toon goal. Is this one we should let go of? Newcastle have been blessed with good goalkeepers for the past decades. Steve Harper is doing a excellent job as nr.1 but our 2 backup keepers are two of the brightest prospects in the country. Krul has a good change of becoming Dutch keeper nr.1 and Forster the same with England nr.1. We have no change of keeping both in the long term and we would have no problem selling one of them with Harry eying Forster and several clubs eying Krul. In that photo he looks like a young Martin Johnson! I would definitely say NO WE SHOULD NOT. Having to listened to some of our fans who have regularly seen both Forster and Krul play, their reckoning is that it is very close but Forster is the better of the two. I would be interested in the views of other bloggers who have regularly seen both these goalies play. Hugh, how could he be born in Hexham AND Newcastle? That would be a Geordie miracle! Do you have some sort of syndrome? Stuart, I know you can’t stop being a prick, but could you please stop being such a big one? We’ll be lucky to hang onto either of them if their heads are turned by so-called “big clubs”. i think theres a good chance we’l end up letting krul go and keep forster as future no1. krul is going to get impatient if he isnt getting first team by next season and if forster keeps progressing so well i think we’l end up letting krul go when a good offer comes in. would obviously love them both to stay but its never going to happen long term. neither of them would be as patient as harper was and why should they be, arguably harper has wasted a lot of his career waiting in the wings and probably would have had at least had a few england caps if he had gone elsewhere a few years back. goalkeepers best years are 26-38. & if we have good young lads coming through also, get shot of whiners. Just wondered that was all. There has to be a syndrome somewhere for someone who cannot help themselves from pulling everyone up on every tiny little thing. It`s known as the “control freak syndrom”, and as one who suffers from it, believe me it aint plesant.